I love being able to listen to my entire music collection throughout my home, in each room of my house. I can even listen to it at work, over the Internet. To get music throughout my house, I run Squeezebox Server. Squeezebox Server is jukebox software that distributes your music library and Internet radio across your home. The software is installed on my home server. A variety of music players in different rooms of my house connect to the Squeezebox Server to play music. There's too much manual work in my digital music workflow. Most of it is related to ripping, using the manual ripper and tagger 'abcde'. To automate more of the process, I decided to try VortexBox. 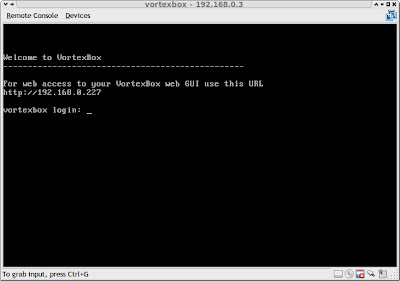 VortexBox is a combined automatic ripping and jukebox system that actually includes Squeezebox Server. 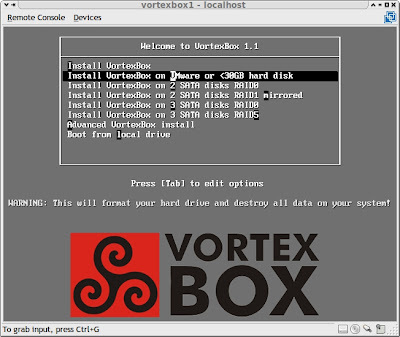 VortexBox is essentially a full music operating system and can be installed on a bare-bones computer, replacing the existing operating system. A quick warning: this section contains computer nerd jargon! Feel free to ask questions in the comments and I can attempt to explain further. Currently, my home server runs Squeezebox Server in a virtual machine. Virtual machines are computers (also called 'guests') that run inside other computers (physical computers called 'hosts'). Virtual machines provide flexibility (they can be moved and power cycled separately to other virtual machines, even though they are running on the same physical computers) and lower power usage (in my case only one computer is required for all virtual machines; this server runs more than just a music system). The virtualisation software I use to run the virtual machines is VMware Server, on a headless Ubuntu Server 8.04 host. 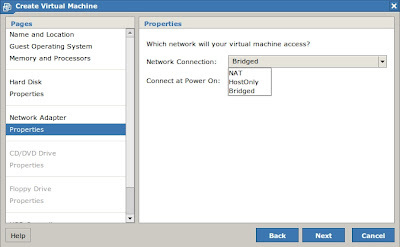 An important step is to configure networking for the VM from 'NAT' to 'bridged'. A bridged network makes the VM appear to be just like any other computer on the network and makes it easy for other computers and music players to connect directly to the VortexBox. 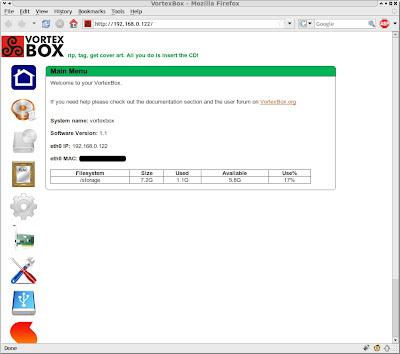 VortexBox is downloadable as an ISO that normally you would burn to a CD and then insert into the real, physical computer you intend to install VortexBox on. However, in our case we can skip that step and link our new virtual machine directly to the ISO. VMware does the work of making the ISO look like a CD to the virtual machine ('VM'). So, when the virtual machine is powered on, the VortexBox installation process starts just as it would with a real, physical machine. The linking of the VM to the ISO is done via the CD/DVD Drive options. 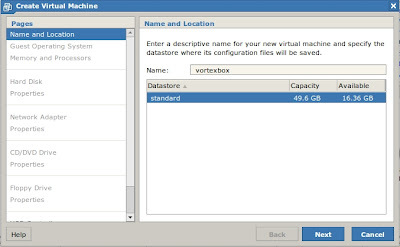 VoxtexBox has a special option for installing to virtual machines. 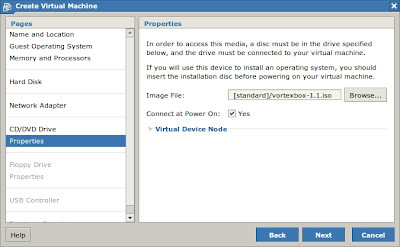 In the installer, choose "Install VortexBox on VMware or <30gb hard disk". The difference is that this form of installation uses up much less space, and instead of repartitioning a virtual hard disk, it creates a directory in which music is stored. This is ideal in my use case, because I intend to link this directory to my NAS. From this interface, you can access the Squeezebox Server, monitor the progress of automated ripping, configure MP3/FLAC mirror directories and more. VortexBox is now installed, but there are more setup steps to go. We haven't improved our digital music workflow yet, but this will come when we link VortexBox to our existing music and enable automatic ripping. This will all be discussed in part two: integration.